This summer we hosted a book launch party for my daughter, Riley Costello, in our backyard. 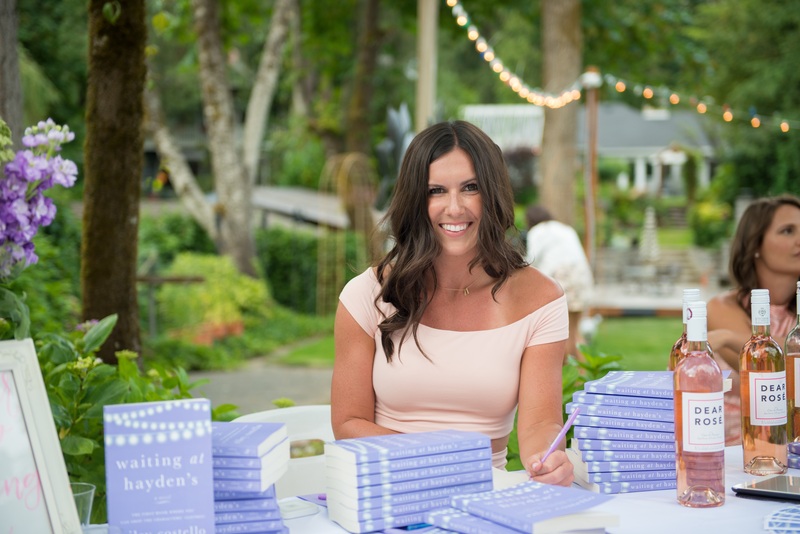 Over 175 people came to wish her success as she starts her journey as the author of Waiting at Hayden’s—a relatable love story that deals with the complicated nature of timing in modern-day relationships. But that’s not all. The book is also the first to be published in the new reading experience format she has coined and branded as shopfiction™. Through links in the digital version and web addresses in the print, readers can watch key scenes unfold and shop the characters’ clothes. What a beautifully written story of young love and the timing and events that make a relationship work. You will not want to put the book down! This is such a great story! Definitely a book you can’t put down once you’ve started. The story lines keep you engaged and wanting more and come together perfectly. Heart-warming, emotional with the perfect touch of humor. One of my favorite reads so far!! I can’t wait for more books by this author. Bought three books for my wife and two daughters, and they have their nose in it with smiles on their faces as I write this. I am happy Daddio did good. Waiting at Hayden’s is a love story like no other! Costello’s integration of film along with the addition of being able to shop the character’s clothes throughout the book is genius. As soon as I was introduced to the characters, I instantly connected to their story, and found myself unable to put the book down. I truly enjoyed watching the events unfold as I completed each chapter and I cannot wait to share this story with others. I know as a Realtor, I’m supposed to be selling homes, but as a very proud Dad, I’m also inclined to sell books. Waiting at Hayden’s is available online at Amazon, Barnes and Noble, and iTunes. After you’ve read it, please leave a review on the website where you purchased it. Just like with Realtors, testimonials go a long way towards word-of-mouth referrals. You can follow Riley on her blog, sincerelyriley.com, facebook, instagram and/or her Amazon author page. This entry was posted in Summer in Lake Oswego and tagged Lake Oswego Oregon, love story, Riley Costello, shopfiction, summer read, Waiting at Hayden's, women's fiction. Bookmark the permalink.